SAGITA COM - Mixcraft 6 adalah software produksi musik yang kuat dan multi-track recording workstation yang datang dikemas dengan ribuan loops musik dan puluhan efek audio dan instrumen virtual. Dengan menggunakan Mixcraft Anda dapat dengan mudah untuk merekam audio, mengatur loop, track remix, membuat dengan instrumen MIDI dan virtual, menambahkan efek, skor, mengedit video, mencampur dan menguasai trek Anda untuk membuat komposisi dengan hasil yang maksimal. 32 bit SSE2-optimized sound engine supports recording and playback of broadcast quality audio up to 192 kHz and 32 bits. Add unlimited VSTi instruments, VST and DirectX effects. Built-in guitar tuner available on every audio track. Create complex virtual instrument setups that layer and split multiple virtual synthesizers and effects. Custom loop library includes over 6000 royalty-free loops and sound effects in a huge variety of styles. 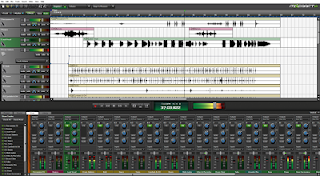 Drum maps included for Mixcraft's drum instruments, plus many popular drum applications. Easily import your own loop files and loop CDs into the loop library. Import WAV, AIF, OGG, WMA, and MP3 files and many more. apakah software mixcraft ini gratis,,?